Saturday May 27 1911 Will went to town. I ironed and got the dinner. It rained in afternoon. I did mending and slept some I went down home at 9.15. Ott met me at the bridge. I wrote to Lizzie Lindley her Father is dead and her brother Art is on the way here with the body. Sunday May 28 1911 I came home on the first car. Mother did not rest well It was raining most of the forenoon. I slept in afternoon. 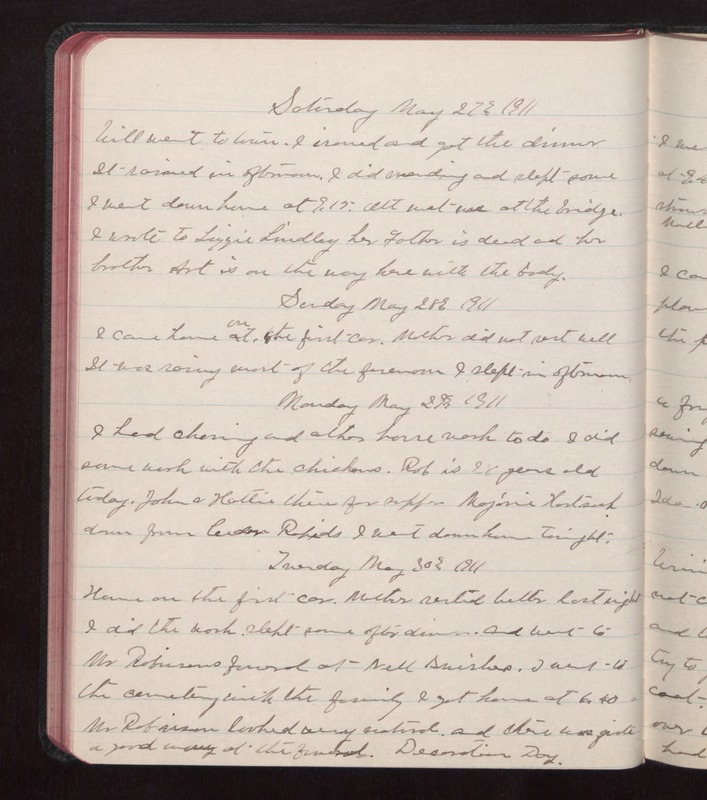 Monday May 29 1911 I had cleaning and other house work to do. I did some work with the chickens. Rob is 28 years old today. John & Hattie there for supper. Marjorie [Hartsock?] down from Cedar Rapids. I went down home tonight. Tuesday May 30 1911 Home on the first car. Mother rested better last night I did the work. Slept some after dinner. and went to Mr Robinsons funeral at Nell [Swishers?]. I went to the cemetery with the family I got home at 6.40. Mr Robinson looked very natural. and there was quite a good many at the funeral. Decoration Day.